Top spot in Group A is up for grabs on Friday night when two teams with a 3-1 record clash in Istanbul. Fenerbahce have won two games on the bounce but Khimki have played three games at home so far, winning them all, which maybe means that they have a lot to prove in this game. The positive and passionate home crowd in Turkey could have an impact on this game as they look to cheer their heroes home in a game that will decide who is top of the group at the halfway stage in Group A. This may count for nothing but you’d rather be top at this point than not be point and with players like Jan Vesely, Ekpe Udoh and Pero Antic on form this season, there is a great chance that Fenerbahce will be celebrating as they make their way into the weekend. If there is to be a match-winner for the home side, it may well be Gigi Datome that does the damage. Khimki’s only defeat so far this campaign came away in Munich but this was their only away match of the Euroleague so far. They’ll be looking for players like Tyrese Rice, Alexey Shved, Zoran Dragic and Petteri Koponen to do the business for them. However, it may come down to Sergey Monia to make the difference in this match and he will be the player that many in the Russian travelling party will look towards to make the most of this opportunity. Khimki are currently first in blocks, with 5.5 per game, and second in steals, 9.8 per game, and these could be important elements on Friday night. The hosts are tipped to win this game and if you are looking for a decent bet, taking Fenerbahce at -4.5, with odds of 1.90, you should have a good option for Friday night. 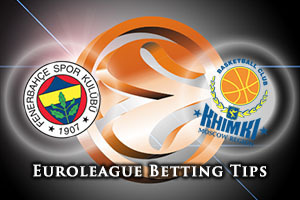 When it comes to the Over/Under market, look to go13 November 2015 Euroleague Regular Season Group A – Fenerbahce Istanbul v Khimki Moscow Region at odds of 1.90. Bet Now!